The @tomofromearth and @vckbee Fighting for the World Birthday Celebration with @World_Wildlife! We all have a special spot in our hearts for Tomo and Vicki. There’s the cuteness, the devotion, the humor, did I mention cuteness? But their never-ending desire to fight for the world’s animals is so inspiring! This year we are announcing what will be an annual birthday drive for Tomo and Vicki in support of the World Wildlife Fund, which they support annually themselves! You can participate in two ways: donate directly to WWF or show us how you fight for the world in your community! Volunteer at a pet shelter, clean up a park, help an elderly neighbor by walking their dog….the possibilities are endless! 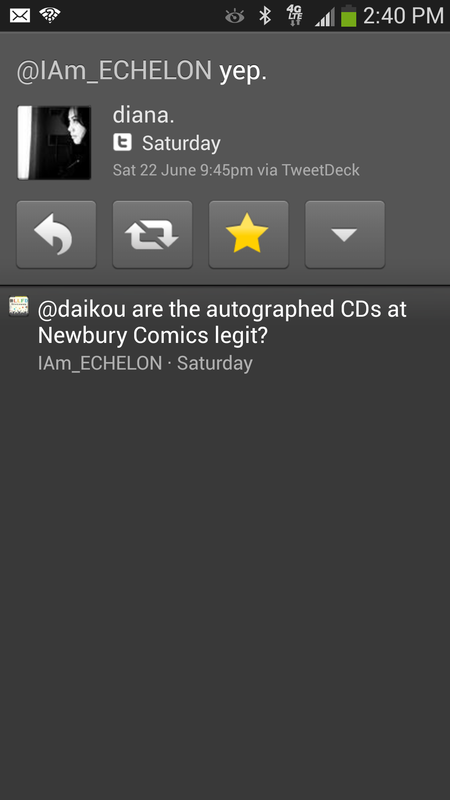 It feels good to give back and show the world why the Echelon are a force to be reckoned with for good. But this year Echelon Donates is giving back as well! We are picking 2 donors at random to win an autographed LLF+D insert purchased from Newbury Comics along with some Echelon Donates stickers! And don’t worry we verified that the autographs are authentic. One winner will be chosen from those who donate money & another will be someone who volunteers their time! Tomo will be made aware of our progress at the Camden, New Jersey USA show M&G on September 29th by one of the members of Echelon Donates. However, donations will continue to be accepted until October 25th! If you are in the US & want to make a tax deductible donation then click here. 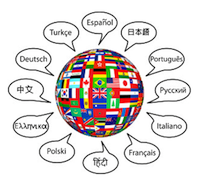 To make a donation in Euros, Pounds or other currencies then click here. To be included in the card that will be sent to Tomo & Vicki you must follow these directions!!!! Did I get your attention? Good! For money donations: Forward the email confirmation to donate@echelondonates.com. Make sure to include your Twitter name or else we’ll use your first name only on the card. If your address is in the confirmation then make sure to delete that prior to forwarding. If you can’t NO WORRIES! We DO NOT share your contact information with ANYONE! For volunteers: Provide an image and describe to us briefly how you spent your time. The Race is on Children of the Giving Empire….let’s show them how we Fight for the World with Tomo & Vicki! 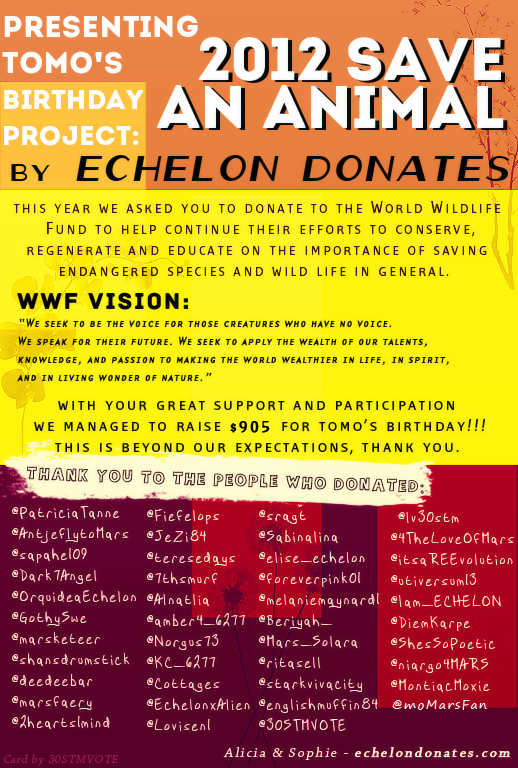 The Echelon Show Their Love: A birthday gift to Tomo Milicevic of $905 donated to the World Wildlife Fund! Thank you to all who donated or volunteered their time at a local animal shelter to honor the MAAANN himself: the wise, mofo-tastic, hair slinging, head banging MAD MAN OF MUSIC HIMSELF… Tomo Milicevic!!! The fundraiser for Vicki Milicevic will happen shortly so STAY TUNED! 2012 Save An Animal for Tomo Milicevic’s BIRTHDAY!!! We all know Tomo is the Simba (Lion King) in his house with his feline pride along with his new addition of Ramsey the pup. That the man is crazy for animals! He even looks like the King of the Jungle with his beautiful shiny black mane! Not everyone can donate money & that’s okay! You could volunteer a day at your local Humane Society, Animal Shelter or walk an elderly persons dog to help them out!!! If you do then SHARE WITH US! Send us a photo of you in action & we’ll add your name to Tomo’s card for helping along with posting it on our blog. To make a donation in several monitory options then click here. To get your name on the eCard that will be sent to Tomo you must follow these directions!!!! WWF USA & WWF International will not be able to provide us a weekly update on the donations so the only way we’ll know if you donated is if you forward the email confirmation to EchelonDonates@gmail.com. Make sure to include your twitter name or else we’ll use your first name only on the card. If your address is in the confirmation then make sure to delete that prior to forwarding. If you can’t NO WORRIES! We DO NOT share your contact information TO ANYONE! The last day to donate is September 1, 2012 as it gives us time to make the card for Tomo & post it so all can make sure no names were omitted in error. We will be sending the card on September 3, 2012 which is the Mofo’s birthday! I’d like to thank all of you for helping promote the Tomo Birthday Tree Planting Project. We raised $413 for a total of 36 trees to be planted in his honor!